The first leg of my 9 month European trip in 2015 consisted of a stop over in Hong Kong to visit some friends and to break up the long flight to Europe. As precious as seeing my friends was, and I tell you it was precious! I was also completely blown away by some unexpected treasures found in Hong Kong. My friend Emma organised a couple of days of touristy activities, I left it up to her to organise the days and she definitely did not disappoint! Somehow she managed to pick the two most tranquil and peaceful activities possible in a city of so much hustle and bustle with hoards of people walking with their heads down looking at their phones. I almost had a few landing in my lap, had I not played dodgems as I propelled myself along the busy streets! The first day consisted of a 20-30 minute ferry ride from Central on Hong Kong Island to Lamma Island or also known as Pok Liu Chao or simply Pok Liu. 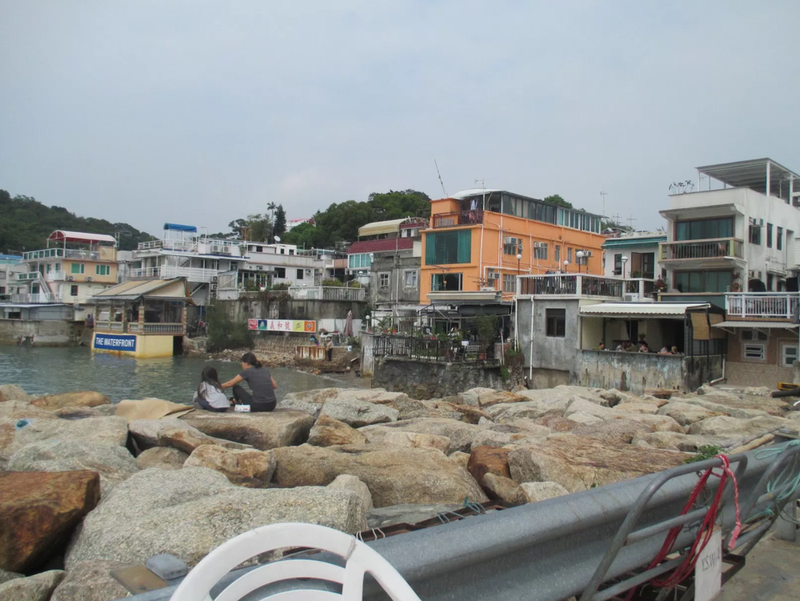 Lamma Island is the third largest island in Hong Kong but you would be forgiven for thinking you are in a completely different part of the world… more like a little fishing village! The island is tranquil and peaceful, there are no cars minus the fire truck, ambulance and open back trucks for carrying building materials. It is an island where people move on foot or on a push bike. There is clearly a community of people who use wheelchairs because most shops and restaurants are accessible and there is even a public toilet block with wheelchair friendly toilets. This I was not expecting and was completely thrilled! It meant I could have a couple of drinks with lunch and a bar stop on the way back to the ferry. The perfect way to relax and enjoy the slo-mo vibe of this gorgeously quaint place. As we strolled along from the ferry stop we continued through to Yung Shue Wan Main Street. It’s a narrow thoroughfare but is bustling with shops selling handicrafts from South East Asia and an easy push for me. The path is sealed and it is just one long road mostly flat. Speckled along it are a mixture of Eastern and Western eateries to satisfy your appetite. It is an island that is cheap to live on, there is poverty amongst the locals and as a result, it has attracted a large expatriate community who live there and work on the main island. The bars were a clear indication of this and made the atmosphere lively yet relaxed at the same time. It was exactly what I needed. A beautiful sunny day with no pressing agenda, just time to enjoy great company and smiling happy people greeting us along the way. Fast forward to day two and here I found myself cocooned in a green haven amidst a jungle of concrete. Chi Lin Nunnery first and then Nan Lian Garden next door, they are found at the foot of Diamond Hill in North Kowloon. Both venues boasted an atmosphere of peaceful tranquility that encouraged whispers and softly spoken words. It was a meditative place where you could forget the pressures of a big city and escape to nature and ancient history and culture. The Nunnery was relatively easy to navigate with ramps and access just about everywhere the public were allowed to go. For those pockets that weren’t, a solution was there provided we notified security and they gave us access to the hidden entrances. The privilege of being in a wheelchair sometimes! One of my favourite parts of the Nunnery was being in the Lotus Pond Garden. It was another sunny day and although I could see the skyscrapers in the distance around the periphery of the gardens, a 30,000 square metre site, it was a place of sanctuary. A slowed pace focussing the eye on beautiful bonsai trees in pots and flowing water in the Lotus ponds. It was the perfect location to look back up at the ancient-like structures designed to replicate the Tang Dynasty and built with no nails, only traditional techniques of bracketing and dowels to hold the timber structure and all made from natural materials such as clay, stone and wood. We moved on to Nan Lian Garden next door for a long stroll along the path designed to be navigated in the one direction, strolling along the Banyan Grove and Pine Path before reaching the Lotus Pond. This is where the incredible Pavilion of Absolute Perfection (‘Golden Pavilion’) is found. Continuing on, there are more ponds and pavilions to capture the eye and all the senses. Varying traditional Chinese landscaping techniques are utilised to create ‘scenes’ in each of the spaces. We ended our day at the snack shop to indulge in some traditional tea and had a look at the variety of items available to purchase in the souvenir shop ranging from pottery and porcelain to traditional Chinese handicrafts, books and preserved food items. Both of these venues are located in the Tang Gallery in the north of the garden. We left Nan Lian Garden very relaxed and satisfied, our senses and our soul had been fulfilled for the second day in a row. I was ready now to head off to Europe and experience a whole other level of cultural education and enlightenment… but that’s for another post or two or a hundred! Take a look at some photos from my trip. Click the image to see it in full size!